These scientifically matched supplement combinations will help set a solid foundation, enabling you to thrive throughout your day and also address more difficult wellness issues. Nutritional benefits will be enhanced as these products have the ability to increase cellular absorption and provide full spectrum nutrients not found in typical diets. The combinations below will offer you a choice to support your specific wellness needs. 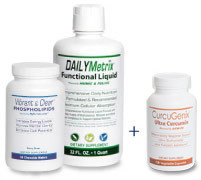 By adding one of our condition specific supplements to the VITALITY COMBO (DAILYMetrix and Vibrant & Clear Phospholipids) your body will have the ability to focus on specific wellness goals. 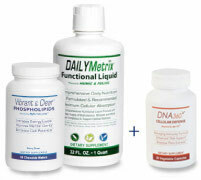 You may want to customize your monthly Comprehensive Vitality Pack. Markit Health has structured our packages to address some of society’s most prevalent wellness concerns however, if you don’t see a package that suits your specific needs, click here to structure a package for your personal goals. Scientifically developed and clinically studied ingredients are an effective way to approach certain maladies the body may be dealing with. Unfortunately many people still believe that a single formula to address the main issue will fix the problem. The fact is the body must be in a balanced state to fully utilize the nutrients to get the desired effect of any condition specific supplement. The science is firmly behind this concept. In addition, consumers need to rid themselves from the idea that addressing an issue with one condition specific supplement for a period of one month will yield results. When the body is out of balance and is representing any disease or pre-diseased state it is representing a physical state that has developed over years, so to think that 30 days of a particular supplement will fix the problem is just not true. These Comprehensive Vitality Packages have been created for one reason; to give an individual the most effective, synergistic, scientific approach to achieve their health goals. 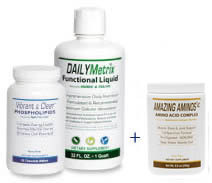 Each of these packages contain 3 products that synergistically address your desired result. While you have the option of ordering a one month supply it is highly recommended that you use the 3 month commitment. This commitment results in an additional $20 discount over a one time order and a $60 discount when ordering 3 individual products. This nutritional supplementation approach addresses specific health issues and has been proven an effective method with benefits that reach beyond the desired result. This system can be referred to as Enhance Your Cells, Feed Your Cells and Focus on the Issue. This nutritional supplementation approach addresses specific health issues and has been proven an effective method with benefits that reach beyond the desired result. 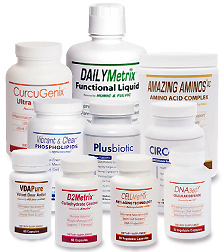 At Markit Health we understand the difficulties of selecting nutritional supplements. With the millions of outlets for information, disinformation and data on ingredients and formulations it can be almost impossible to make a decision. Without the assistance from a professional nutritionist, dietitian or integrative medical practitioner the choices can become overwhelming. Even with assistance from these professionals the final decision of purchasing comes down to you, the individual. Providing the body the nutrition it needs to age in a healthy manor may be impossible due to several reasons. Lack of nutrition in today’s food products, busy schedules and poor quality supplementation are a few of these reasons. We believe nutritional programs should be a part of a persons whole life and they become even more important after age 40 and a necessity after age 60. Markit Health conducts comprehensive analyses into superior supplements and products that help create wellness. Thousands of hours of research and hundreds of interviews with doctors and scientists have prompted our company to offer an exclusive product line. All of our products are the most effective in their categories and have substantial proof of their efficacy. Each of our Comprehensive Vitality Packages includes two of our products that are absolutely necessary to any nutritional program. 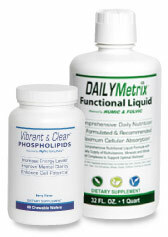 These products are DAILYMetrix Functional Liquid and Vibrant & Clear Phospholipids. 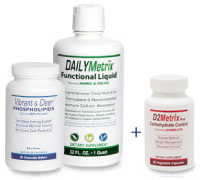 These powerful formulas are used by hundreds of clinics in the United States and for good reason. We pair them together with our Enhance The Cell, Feed The Cell approach. When your body is functioning properly you can benefit from additional supplements to address specific health concerns by adding one of our many condition specific formulas. We at Markit Health are committed to your wellness, whether you are trying to address a specific health issue or looking to lead a healthy, vibrant life as you age. The packages above represent discounted prices and free shipping. The best prices are based on monthly shipment commitments. IMPORTANT NOTE: Any nutritional health approach can take several months to take full effect. Our customers’ requests have guided us to create this package service. It offers several benefits for you, the consumer. These are: Lower Prices, Free Shipping, Priority Fulfillment, No Hassle Processing and Self Compliance Monitoring. You may cancel at any time, without any questions, and we mean it!